Find that buried treasure and impress those pirates at your next themed pirate when you walk in looking hotter than Keira Knightley in the pirates of the caribbean in this Ladies' Buccaneer Beauty Pirate fancy dress costume. Features a tight fitting brown bodice top with a lace up front, a pair of white sleeves, a brown striped ragged hemline skirt with a red waist sash to tie around the hips and a head tie to complete the pirate costume. 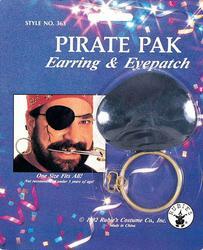 Great for a pirate themed fancy dress party!